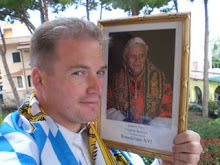 To each his own by the Belgian chasubles in the top photo sure look nice. In the middle photo can be seen the arms of the R.F.S.P. (Reverend Fabric [workshop] of St. Peter's) and in the bottom photo is the 1940s material with the tiara/keys and barque of St. Peter. Are these vestments in the sacristy of the Vatican Basilica? Chasubles in St. Peter's sacristy used to look like the one in the middle pic but those have been given away. I love this web site. Although it is bittersweet when we see what we have lost. These vestments belong to a priest in a little town in Italy (he showed them to us in his sacristy). What is an "onomastico" day? Why don't we own this place.? Christmas wish list: season of giving..
December Rome: the oranges are ripe!